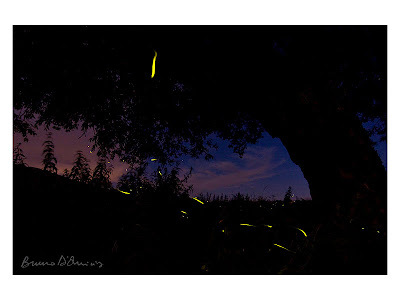 More than 30 years ago, the Italian poet (and prophet) Pier Paolo Pasolini wrote about the disappearance of fireflies as a famous metaphor of the profound and rapid change underwent by Italy in its economic and social structure. This quick change from a peasant land into an industrial nation happened in the '50s and '60s and was called Italian economic miracle. The reality is that this phaenomenon involved mass exoduses of peasants from Southern Italy toward the industrial centres of the north, class differentiation, chaotic urbanization, air and water pollution and, above all, a sort of cultural genocide, which changed the face of this land and its people for ever. Now, almost 50 years later, I feel as if we are facing a new "disappearance of fireflies" in this country, and, perhaps, in many others, as well. The same old threats maybe just with a new look. Everyday, as a photographer working on the territory, it hurts to witness among most of people a widespread illegality mixed with an absolute lack of interest toward environmental issues. This absence of any sort of "healthy" relationship between Us and Nature makes easier for speculators and exploiters to encroach up the last patches of wild land. The so called "clean" windfarms of today are like the chemical factories of yesterday. The golf courses, the sky grounds of the past. Windfarms are, in fact, growing everywhere in the highlands of Italy, and especially on the precious ridges of the Apennines. The golf courses subsititute mountain meadows and old fields. Dump sites and quarries pollute the water and the soil for a long time. Behind their appearance of necessary development and quick economic reward, these are just new ways to sell out the land and destroy what most important has been left to Us: the chance to still live and enjoy the world of our past as our ancentors did. I still want to drink water from a stream, walk on a mountain ridge with an eagle soaring above me, ride my bike across blooming fields, sit down and look at the fireflies sparkling as darkness comes. These are things I enjoyed since my childhood and cannot see disappear without doing anything. Each of Us must have a place of his own, his "homeland", and to protect it, I guess it is important to live it as much we can; get to know it; understand it and learn to love it. Come on, it's still summer outside!